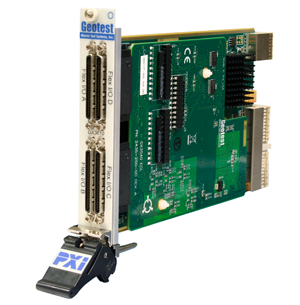 The GX3609 is a 3U PXI FPGA card with 80 TTL differential channels. The GX3609 is comprised of a GX3500 FPGA card and the GX3509, 80 channel, differential TTL expansion card. The board is supplied with the GXFPGA library, a software package that includes a virtual instrument panel, and a Windows 32/64-bit DLL driver library and documentation. The virtual panel can be used to interactively program and control the instrument from a window that displays the instrument’s current settings and status. In addition, interface files are provided to support access to programming tools and languages such as ATEasy, LabView, LabView/Real-Time, C/C++, Microsoft Visual Basic®, Delphi, and Pascal. An On-Line help file and PDF User's Guide provides documentation that includes instructions for installing, using and programming the board. A separate software package - GtLinux - provides support for Linux 32/64 operating systems. Terotest continue to provide totally integrated test solutions using proven, 'off the shelf' Automatic Test Equipment (ATE), customised to suit your needs.